The acoustic (eighth cranial) nerve includes branches that mediate the sense of balance and head position (the vestibular nerve), as well as hearing (the cochlear nerve). Acoustic neuromas are benign tumors that arise from the vestibular portion of the acoustic nerve. Surrounding each nerve fiber are Schwann cells that form a substance called myelin that insulates nerves and facilitates electrical conduction. It is from Schwann cells in the vestibular nerve that an acoustic neuroma, also known as a vestibular schwannoma, arises. Schwannomas also may be referred to as neurilemomas, neurolemmomas, and peripheral fibroblastomas. Because of the location of acoustic neuromas, the initial symptoms of these tumors involve hearing and balance. Tinnitus (ringing in the ears), hearing loss, disequilibrium, and vertigo are common and caused by compression of the eighth cranial nerve. As the tumor enlarges, it expands in the space of the cerebellopontine angle, a region near the brainstem, and the seventh cranial nerve, which controls the facial muscles. When a tumor is large enough to compress surrounding structures, it may cause headaches, facial numbness and/or weakness, double vision, nausea, vomiting, and hydrocephalus, a blockage in the flow of the cerebrospinal fluid that bathes the brain and spinal cord. As with most brain tumors, imaging studies are essential to diagnosis. Both magnetic resonance imaging (MRI) and computed tomography (CT) scans can be used. In the case of small tumors, CT scans may show only an enlargement of the ear canal, while MRI scans may show only a thickened eighth cranial nerve. For either study, an agent that provides contrast in the image is administered intravenously so neurological surgeons can visualize the tumor against the normal tissue in the background. Larger tumors will appear more distinctly on MRI scans, and symptoms caused by their effects on surrounding structures will be apparent. After a patient has been diagnosed with an acoustic neuroma, several functional tests usually are performed. These include detailed audiologic tests to assess hearing and the House and Brackmann Scale that assesses the degree of function of the facial nerves. These tests provide a detailed picture of the functional involvement of the tumor so that surgery can be tailored to preserve this level of function. Preservation of hearing is a significant concern; there are surgical approaches that result in hearing loss and those that do not. Neurological surgeons choose an approach based on the results of functional tests, size of the tumor and the patients overall health. If a tumor is small and does not cause symptoms, it may be observed over time rather than treated immediately. In cases in which treatment is necessary, surgical removal has been considered the best therapeutic option. Because acoustic neuromas are slow-growing benign tumors, complete removal often results in a cure. The advent of stereotactic radiosurgery, and in particular Gamma Knife radiosurgery, which involves the use of a highly focused beam of radiation to target the tumor, now provides an option that does not require open surgery and poses less threat to functional areas of the brain. 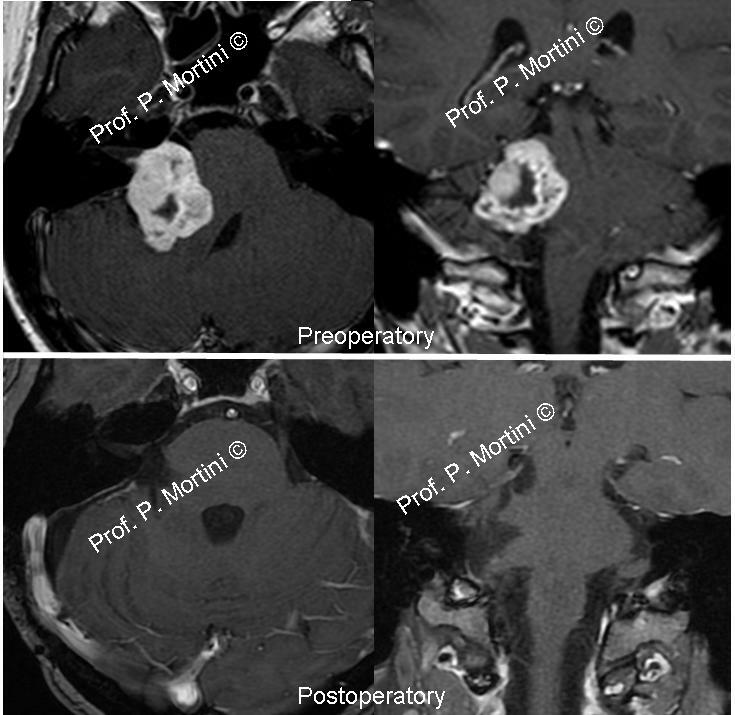 Stereotactic radiosurgery, usually for smaller tumors, can be used to treat the remnants of large tumors when a subtotal surgical resection is used to preserve facial function. Because of the complexity and rarity of these tumors, treatment with either observation, surgery, or radiosurgery should be done by doctors and hospitals with extensive experience in the total management of these tumors. The teams concentrated experience is what leads the best possible outcomes for patients with acoustic neuromas.